Music brings in freshness and inspiration, and hence you may listen to the songs and music tracks on a daily basis. 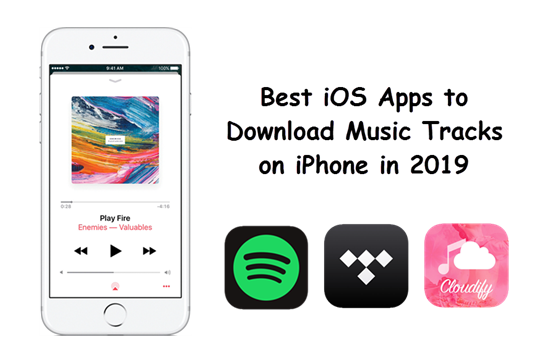 If you work with iPhone, you will need the best iOS apps to freely download music tracks. It is to be noted that Apple has modified the terms and conditions and removed the majority of music downloaders apps from the AppStore. The main reason for removing the music downloaders from the AppStore is not only to eliminate piracy but also to avoid illegal music distribution. Therefore, you will find it difficult and tedious to download free music tracks with iPhone. In this article, we lists the 4 best apps to download music on iPhone. You should note that the apps listed on this article are applicable not only for iPhone but also to iPad and iPod devices. Spotify is a popular music service app in the US with an elegant user interface. You will be able to listen to music either on iPhone or iPad. You can easily search for tracks, artist and album including the ability to create and share playlists. 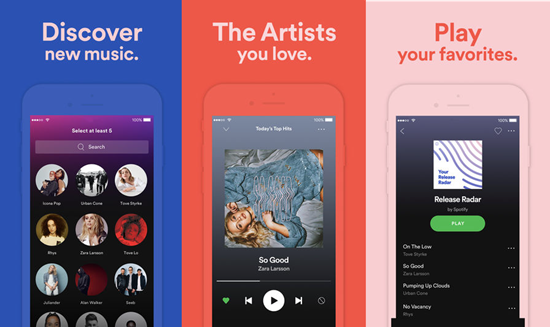 The Spotify app includes several customized recommendations with ready-made playlists. Do you want to listen to music without any ads? If so, you should check out Spotify Premium. It is also possible to use Shuffle mode to play music. Moreover, the app is compatible with various smartphones, tablets and PC. The main advantage of Spotify is that you will be able to listen to music offline with improved sound quality. You can make use of the search module to locate and fetch the music as per your requirements. To download music via Spotify, you should add tracks, artists or albums to your playlist. You should navigate to the Songs that you want to make offline. The next step is to toggle Available Offline option into color green. You should wait till the song or album is completely downloaded. You should go Settings > Playback inside the app and enable offline mode to download music without depending on the Internet connectivity. Tidal app provides high fidelity sound quality with HD quality music videos alongside 50 million tracks. The app is equipped with curated editorials by music journalists and experts. Moreover, the Tidal app provides support for lossless audio, which helps you to enjoy an awesome music entertainment experience. The advantage of the Tidal app is that there will be no ads and you can experience crystal clear images. The app provides tailor-made recommendations with integrated album presentations and playlists. It is also possible to read and manage integrated music articles, features and interviews. 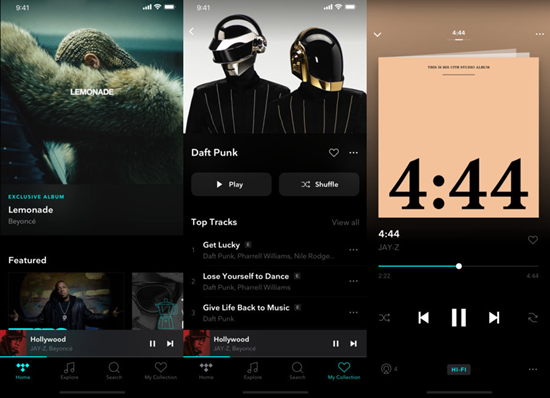 You can download albums, tracks and playlists with Tidal app to listen to them without any Internet connectivity up to three devices. If you pay $19.99, you will be able to enjoy premium music tracks with support for offline listening mode. You can save a music track directly to your iPhone with the help of the offline mode. The Tidal app will be highly useful if your connectivity is slow or your data plan is expensive. The Apple Music app is installed on iPhone by default and you can work with the app as soon as you un-box the iPhone, iPad and iPod. The app provides all the required functions such as playing/pausing music and playlist creation. It is also possible to either merge or replace music tracks. The purpose of the Merge functionality is to not only keep all your tracks but also add the new music tracks to the existing music library. To keep updating, Apple regularly release new versions along with the new iOS platforms. The main attraction of the Apple Music app is its ability to download music for offline playback. To work with this app, You need a valid Apple ID and purchase a monthly subscription. You need to navigate to Settings > Music and click on “Join Apple Music”, then choose your subscription accordingly. To initiate music download process, you should run the Music app and locate for a song or artist. The triple dots near the song or artist name should be tapped. Then You should select Make Available Offline option to save the music to your iPhone. Cloudify provides support for latest iPhone and iPad models. The smart playlists it provides are similar to iPod playlists. You can view the last added, played and rated songs besides 25 most played songs. You will be able to synchronize music from iPod library. 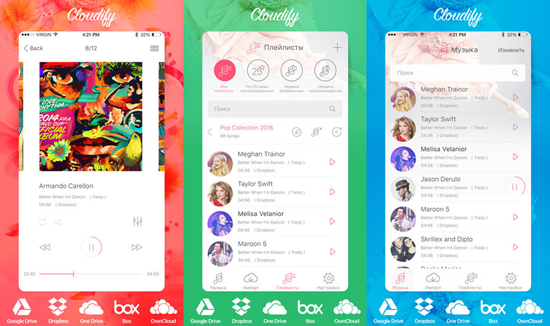 It is possible to search by songs, by albums, singers and genres, and also to move files from one particular folder to another. And You can play a music track directly from the file manager. The Cloudify app provides support for album covers including the ability to view song lyrics. You can activate repeat and random selection modes with high-precision slider that enable you to rewind songs. The app also comes with background music mode for iOS 4 and above. It is possible to create playlist from the list of songs in the player with the capability to add files from a playlist to the currently available one. The Cloudify app also includes a dedicated tag and song lyrics editors. You can rate and review songs just like in iTunes. The latest version has added support for Apple Watch with bug fixes. The iOS provides a wide range of music download apps, which you can make use of with your iPhone or iPad. It could be impossible for you to establish connectivity with the Internet when you are on the go, since in some areas, the connectivity will be weak and unstable. Hence, you should download the music download apps in advance so that you can listen to your favorite music tracks freely. You can download music using any one of the apps mentioned above. The next time when you go for a long vacation or picnic, you then can download music tracks to your iPhone so that you can listen to favourite songs easily irrespective of the location. How is your experience of using these music apps? If you have any question or suggestion, feel free to leave a messages in the Comments below.